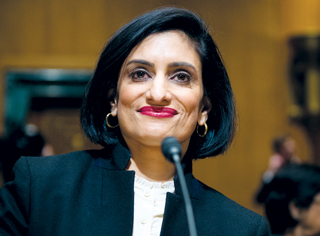 CMS Administrator Seema Verma: “We’re deeply concerned about potential inadequacies in staffing." Following recent national furor over nursing home staffing levels, the federal government declared Friday it is stepping up oversight measures, including more focused surveys. Industry advocates say the announced changes won’t help. The Centers for Medicare & Medicaid Services announced that it will be turning up the heat, particularly on weekends. The changes come after a Kaiser Health News analysis in July uncovered an average of 11% percent fewer direct-care nurses and 8% fewer aides on duty on weekends. Analysts also showed that one-fourth of nursing homes reported no registered nurse on duty for at least one day during a three month period — despite the Medicare requirement that an RN be on duty at least eight hours per day. As part of their new initiative, regulators this month will start telling states when staffing shortages appear. They’ll also clarify how skilled nursing facilities should report hours and deduct meal breaks. In addition, administrators will be offered CMS tools to ensure that census counts are accurate. The State Operations Manual has required states to conduct at least 10% of standard health surveys on the weekend or during off-hours. For facilities on the new lists being provided by CMS, however, states will have to conduct at least half of the required off-hours surveys on weekends. Industry trade groups said Friday that they appreciate CMS’s intent, but don’t believe its actions will address the field’s ongoing staffing challenges. LeadingAge CEO Katie Smith Sloan said that while PBJ data has helped to improve the accuracy of reporting, it is still relatively new and the group’s members continue to experiencing administrative difficulties with the reporting changes. She said that staffing is a complicated issue — driven by inadequate Medicaid reimbursement and fierce competition from other sectors — that nursing homes are working hard to address.